This page was produced in collaboration with Claire Moyse-Faurie (Research Director, LACITO-CNRS) ; editing and supplementary information provided by Stéphanie Geneix-Rabault, Annick Kasovimoin and Weniko Ihage from the Académie des Langues Kanak. NB: The name “kanak” comes from the Hawai’ian word “kanaka”, which means “man”. The spelling “canaque” is from the time when New Caledonia was colonised by the French and is therefore considered pejorative and is now obsolete. Officially, the word “kanak” is invariable for gender and number. Where are Kanak languages spoken? These languages are spoken in the archipelago of New Caledonia, in the South Pacific, in the region generally called “Melanesia”. New Caledonia consists of la Grande Terre (the main island) and numerous islands and islets: the Belep Islands in the North, Ouen Island and the Isle of Pines south of La Grande Terre, and the four Loyalty Islands which stretch alongside the East coast of La Grande Terre for approximately 10 kilometres. Of these latter islands, Ouvéa is the northernmost island, then Lifou, Tiga Island and finally Maré In the South. The term “Kanak languages” covers the languages spoken on La Grande Terre and on the Loyalty Islands by the native peoples living there whose ancestry predates contact with the Western world. 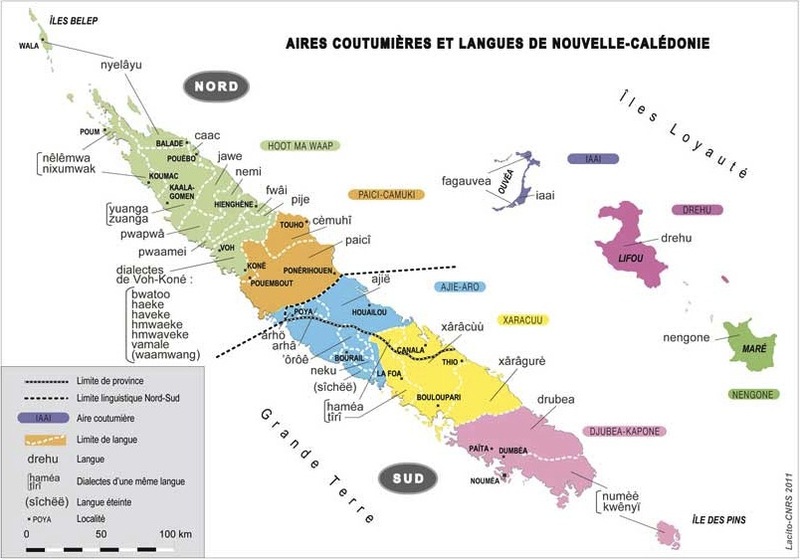 All other languages spoken in New Caledonia are linked to its colonisation (French, Javanese, Vietnamese, etc. ), or to recent migration (Tahitian, Wallisian, Futunan). In addition to these languages, contact between the French and groups of Kanak populations around the Saint Louis Mission near Noumea in the second half of the 19th century, led to the emergence of Tayo, a French lexifier creole. The Kanak languages all belong to the Oceanic group in the Austronesian language family, which includes 1000 to 1200 languages. There is no genetic link with Papuan languages or Aboriginal Australian languages. Within the Oceanic language group, all Kanak languages (apart from one) belong to the subgroup “New Caledonia and Loyalty Islands”, and are descendants of Proto-Oceanic. The exception is Fagauvea, which belongs to the “nuclear Polynesian” subgroup, from Proto-Polynesian. This Polynesian language was introduced to Ouvéa many centuries ago with Polynesian migration from the East to the West from various islands. Based on their oral tradition and comparative studies of Polynesian languages, it is most likely that the migrants were from Wallis, Samoa, Futuna and Tonga. New Caledonia has 28 Kanak languages, which are generally divided into two groups: the languages of the Loyalty Islands and those of the main island, La Grande Terre. The latter group can also be split into two subgroups with diametrically opposed features: the languages of the South and the languages of the North. Lying somewhere between these two groups is Paicî, which resembles the languages of the South but has strong genetic links to the languages of the North. In line with the Matignon-Oudinot agreements of 1998, 8 Custom Areas (aires coutumières in French) were created in New Caledonia: 5 on La Grande Terre and 3 on the Loyalty Islands. Each Custom Area has a Council (Custom Senate) whose role is to manage all concerns relating to Kanak culture and language. Kanak languages and custom areas of New Caledonia (LACITO-CNRS, 2011). Kanak languages in New Caledonia are spoken by a total of 70 428 speakers over 14 years of age (ISEE, 2009). The Academy of Kanak Languages (ALK) is a public organisation in New Caledonia. Created in 2007, its mission is to establish rules of language usage and to promote and develop the 28 languages and 10 or so dialects used in New Caledonia. Its main priorities are the standardisation of orthography and the diffusion and development of New Caledonia’s rich linguistic heritage. The actions it undertakes are many and varied: performances, festivals, conferences, fund raising, technical help with the organisation of tools and support systems for Kanak languages, competitions, etc. In 1863, the Guillain decree banned the use of “indigenous tongues” in schools, and in 1921 all publications in Kanak languages were forbidden. It was not till 1984 that these kinds of rules disappeared. The Matignon-Oudinot agreements of 1988 and the Noumea agreement of 1998 introduced the legal case for Kanak languages to be used today. Section 1.3.3. of the Noumea agreement stipulates that “Kanak languages are, along with French, languages of education and culture in New Caledonia. Their place in education and the media must be developed and reflected on deeply”. Since 1992 and the expansion of the Deixonne law in New Caledonia, four Kanak languages are taught at Secondary School and can be used in the baccalaureat exams: Paicî, Ajië, Nengone and Drehu. A programme of study for Regional Languages and Culture was created at the University of New Caledonia in 1999. In 2005, congress introduced teaching of Kanak and Oceanic languages and culture into official programmes in Primary Schools. This has been in place in public Primary Schools in years 1 and 2 since 2006, the idea being that it will be expanded in later years subject to the outcome of this experimental teaching. Currently, 15 Kanak languages are being taught in public preschools (DENC 2011). The 1988 Noumea Agreement says that “the place of Kanak languages in the media must be developed and reflected on deeply”. On local radio stations, only the Ruo programme, launched by ADCK in 2001 on Radio Djido, has lasted. In addition to this, the ALK broadcast radio stories in Kanak languages on RFO in 2009, which were played three times a day from Monday to Friday. As for written media, the ALK published pamphlets in various Kanak languages in Les Nouvelles Calédoniennes (the daily local newspaper) each Friday (2011), with online versions as well to aid comprehension of the languages. In the 2009 edition of UNESCO’s Atlas of Endangered Languages, 18 Kanak languages were listed as endangered, with 5 of these listed as critical. Most of the endangered Kanak languages are spoken on La Grande Terre. Among these, Sîshëê is generally thought to have been extinct since 2006, but it is possible that there are still around 10 speakers remaining. It is, in any case, at least on the verge of extinction. The other languages listed as critical are Pije, Pwapwâ, Arhâ and Arhö, which are at risk of dying out in the very near future if nothing is done to revitalise them. All of the other languages of the 5 Custom Areas of La Grande Terre are endangered to varying degrees. Those which UNESCO does not consider to be endangered are: Nêlêmwa/Nixumwak, Yuanga, Nyelâyu, Paicî , Cèmuhî, Ajië, Xârâcùù and Numèè- kwênyii. These languages are thought to be in good health and are often dominant languages, used as lingua francas by the Kanak peoples in their respective Custom Areas. Nevertheless, they are very much in retreat when compared to French. And, despite recent efforts to promote them, there remains much to do before they can truly be considered out of danger. The languages of the Loyalty Islands are quite healthy and thriving, with only one language (Fagauvea) considered to be endangered by UNESCO (level 1 of 5). Without doubt, the health of the majority of these languages is linked to their relative isolation and the small population of French speakers living on the Loyalty Islands. Cerquiglini, B. (dir. ), 2003, Les Langues de France, Paris, PUF, p. 347-435. Bonvini, Emilio, Joëlle Busuttil & Alain Peyraube (dir. ), 2011, Dictionnaire des langues, Paris, PUF (several articles in French on the classification of Austronesian languages and the different subgroups, as well as individual languages such as Xârâcùù, Nêlêmwa, and Iaai). Corpus de la Parole website (French Ministry of Culture and Communication / CNRS): corpus of texts in 13 Kanak languages (Drehu, Ajië, Bwatoo, Cèmuhî, Fagauvea, Iaai, Nââ kwényï, Nêlêmwa, Nemi, Nengone, Xârâcùù, Xârâgurè, Yuanga) as well as Wallisian et Futunan. CDP-NC website: section on the languages and cultures of New Caledonia.